Scaffolding set up around the perimeter of the lot near Vermont and Manchester doubles as clothing racks for vendors on the weekends. Sahra Sulaiman/Streetsblog L.A.
Last year, on the 23rd anniversary of the 1992 riots, then-councilmember Bernard Parks held a groundbreaking ceremony with developer Eli Sasson and a host of local dignitaries at the site of the proposed Vermont Entertainment Village. The shiny new open-air mall, Parks and others claimed, would anchor positive growth in the South Los Angeles neighborhoods around Vermont and Manchester and transform them into a destination. 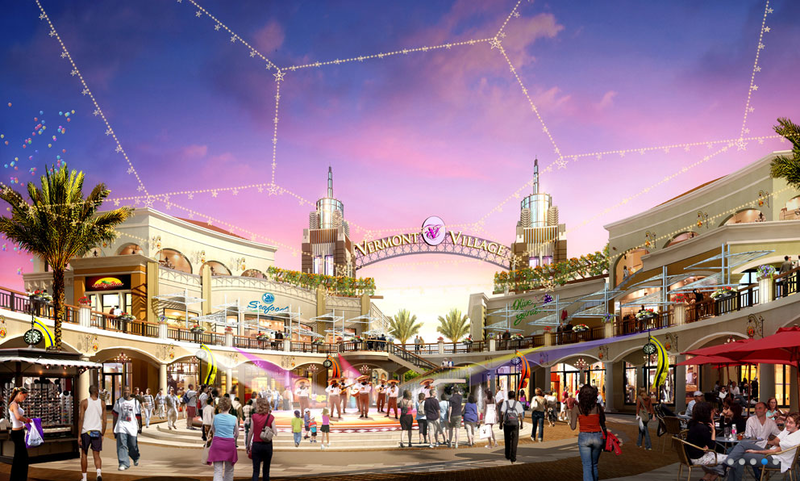 According to documents the Sassony Group filed with the city in 2014, the project was to be a “two- to three-story, approximately 127,000 square foot retail shopping and entertainment center” with a central courtyard for cultural programming and public entertainment (below). Local residents had been thrilled at the announcement there would be a full-service grocery store and that local hire would be considered “mandatory,” with regard to construction. Their optimism had been further fueled by Parks’ announcement in a Facebook post (which was removed very shortly afterward) that he had been talking with major (unnamed) retailers who were interested in the space. His claims had made the projected completion date of winter 2016 seem like it might be feasible. But residents would have settled for a less flashy project, too. Not because they were particularly concerned about gentrification, per se, they just wanted to see something positive happen on the site after so many years of neglect. 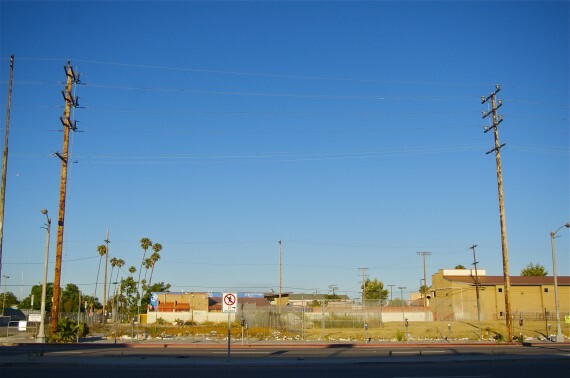 The lots at Vermont and Manchester effectively constitute one of the most glaring visual reminders of how the hardest-hit neighborhood in South Los Angeles had been left to fend for itself after the riots [see the burnt-out swap meet that sat on the site, here]. Covering two full city blocks and sitting directly across the street from County Supervisor Mark Ridley-Thomas’ Constituent Service Center, the blighted space has thumbed its nose at local officials and area residents for more than two decades, an unhappy homage to all of the city’s broken promises to rebuild and revitalize. The sun sets on the vacant lot at 85th and Vermont, directly across the street from County Supervisor Mark Ridley-Thomas’ Constituent Service Center. The lot is one of two block-long lots owned by Eli Sasson. Sahra Sulaiman/Streetsblog L.A.
Resident Dana Gilbert, fearful that the community was being sold yet more horse manure, showed up to last year’s groundbreaking carrying an image of himself walking the lot with then-Mayor Tom Bradley 23 years earlier. He was unlikely to get the job he had been promised back then, he knew, but he wanted reassurances that area youth would now have a chance to find steady work. 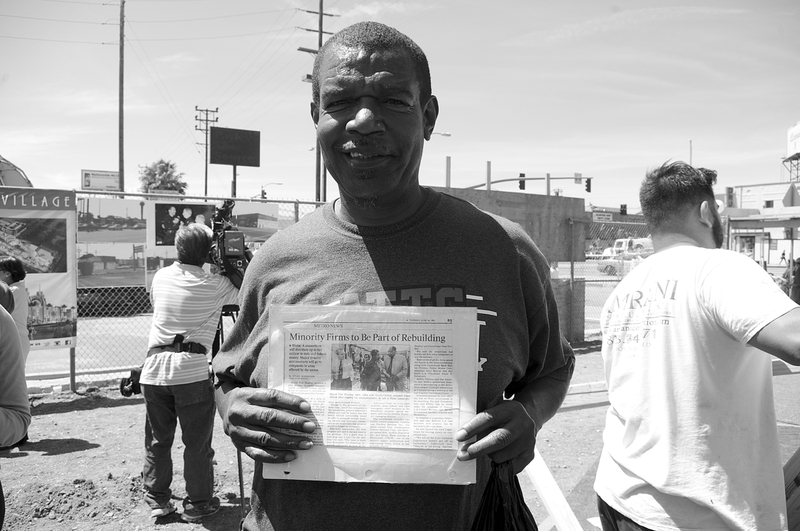 At the groundbreaking for the Vermont Entertainment Village, South L.A. resident Dana Gilbert holds an L.A. Times article from 1992 about the plans to rebuild the vacant lots at Manchester and Vermont and the jobs the effort would bring to the area. The article features a photo of himself with then-Mayor Tom Bradley. Gilbert showed up to ask about the job he was promised 24 years ago. Sahra Sulaiman/Streetsblog L.A. Unfortunately, the project appears to have stalled almost immediately after the hoopla of last year’s groundbreaking. The only activity seen at the site since then has come in the form of sidewalk vendors (at top) and an occasionally large homeless encampment. 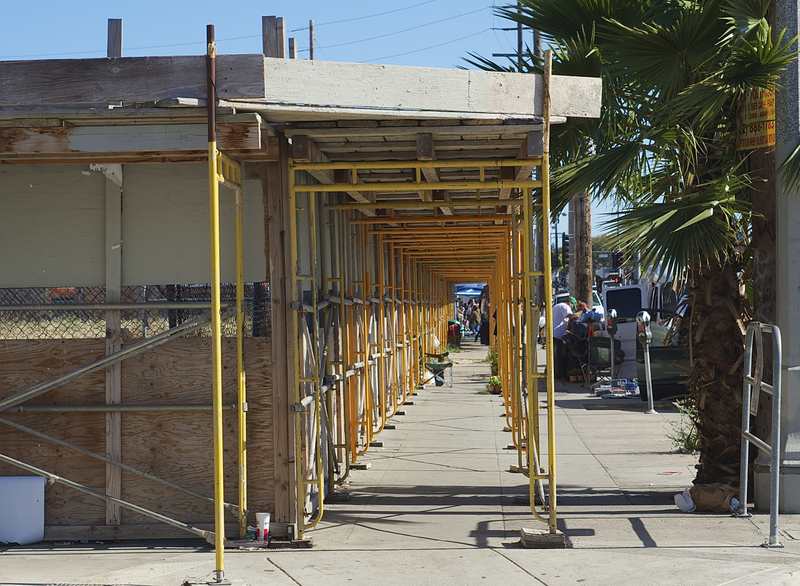 Both groups seem to have made the most of the fencing – the particle boards afford the homeless some privacy by hiding the encampments from public view while the scaffolding serves as racks for the vendors. When the fencing went up in the spring of 2015, so did residents’ hopes. But the project appears to have stalled since then. At different times of the year, you can peer through the gap in the fence (at left) and see homeless encampments. Sahra Sulaiman/Streetsblog L.A.
Searches of Department of Building Services’ records yield a long list of Range Files (notices of violations) and one permit granted for the demolition of the Payless shoe store which took place during the groundbreaking last year. But nothing more. Similarly, City Council files show a flurry of activity leading up to the April 2015 groundbreaking and the approval of zoning changes in the month or two after the ceremony. And then all activity appears to cease. Sassony Development’s twitter account – apparently created expressly for this project – has a grand total of three tweets: one touting the impending groundbreaking in April and two in May, 2015, posted from the International Council of Shopping Centers convention in Las Vegas where then-Chief Operating Officer Jennifer Dueñas was reaching out to potential retailers. The Sassony instagram account followed a similar trajectory – several images were taken at the groundbreaking and the last two were of Dueñas at the Vegas convention. When reached via phone this past April, Dueñas explained that, after sending out press releases regarding the project last year, they had gotten so many phone calls she had practically been “forced” to go to Las Vegas. 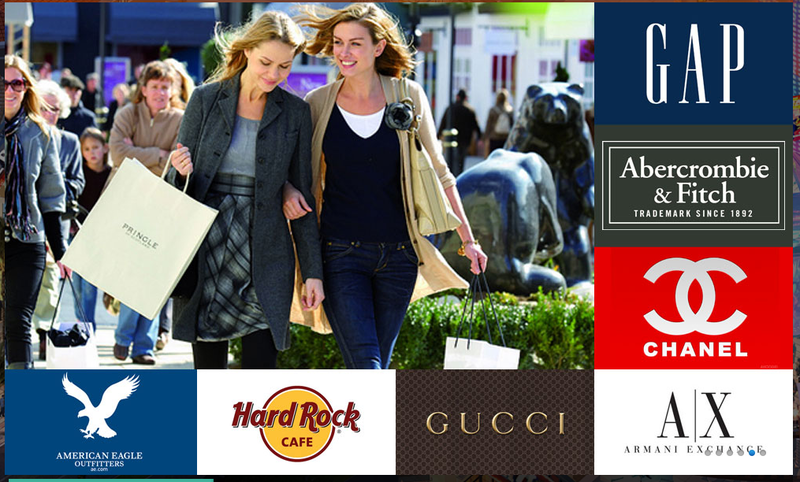 So many major retailers – pharmacies, sit-down restaurants, movie theaters, etc. – were eager to participate in the project because they “knew how much buying power” was in the community that she had had to meet with them in person, she said. Mr. Sasson’s heart, she continued, was truly invested in seeing this project come to fruition. But the project had stalled because of all the hoops the city was asking him to jump through to get building permits, she said (perhaps someone can find the unreasonable conditions I didn’t spot in these city approvals of zoning changes?). And even though she herself was no longer with the Sassony Group, she was still indirectly active with the project in that she was busy finding tenants for the site. She believed in the project, too, she said, and was looking forward to seeing the promise to the community fulfilled. Dueñas is a very likable and deeply positive person (at least in my limited encounters with her), and I genuinely did not doubt her sincerity. But as most residents and representatives of the area who have long lobbied for quality grocery stories, retailers, and sit-down dining options can probably tell you, the claim that retailers were fighting to tap into the spending power of the community is something that has pretty much never been said about South Central. Which means that getting a handle on what is actually true with regard to where the project stands is far more complicated than it should be. During our conversation, Dueñas had asserted that Sasson himself was very bad at telling his own story which made it easy for him to be painted as the villain in his dealings with the city. Multiple attempts to contact the Sassony Group starting in late March in an attempt to suss out where his intentions were misunderstood were not returned. So, I will just have to draw conclusions about the project’s status using what I have been able to observe thus far. Last year’s groundbreaking was such a hodgepodge of contradictions that the real aim of the ceremony appeared to be the bolstering of councilmember Parks’ legacy, not launching a major construction project. Residents from the surrounding community were barred from entering the lot to witness the ceremony. Those arriving with postcard invitations to the event in their hands or after seeing the preparations for the ceremony on the local news were told it was a “private” event. Any non-dignitary wishing to hear what a great leap forward speakers thought this project was for the community had to resort to peeking through gaps in the plywood fencing until after the official festivities were over. Odder still was the marketing of the project: only 4 miles from downtown!, free shuttle service to USC!, a reference to South Los Angeles as “SOLA!” A video promo straight out of the 80s by Architecture Refined Corporation was totally devoid of any meaningful reference to South L.A. Even the retailers Sassony seemed to suggest it was courting (below) seemed out of step with the community. It wasn’t clear who this project was ultimately going to be aimed at, but it was clear that, whoever they were, very little time had been invested in thinking about how to reach them. At the ceremony, a few staff linked to community leaders – all of whom were very familiar with Sasson’s dealings with the community – voiced lingering questions about whether the project was even real to begin with. Sasson’s earlier proposals for the site – going as far back as 1999 – did not seem to indicate he was invested in seeing them flourish. And when he sold off some of the adjacent parcels at 83rd and Vermont in the mid-2000s (now the site of the DPSS building), he dashed the community’s hopes for a major retail center and affordable housing project. 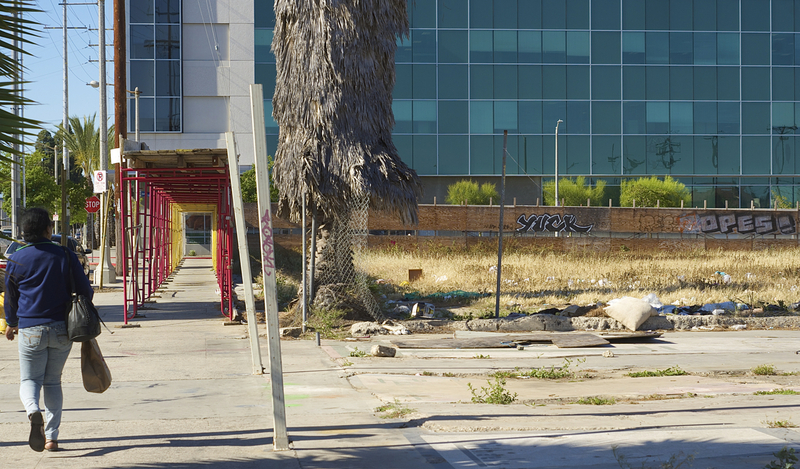 According to a 2008 L.A. Times story, Sasson had previously asked that the city help finance his project in return for him taking on retail development there. Later, he thwarted the Community Redevelopment Agency’s (CRA) effort to purchase the land (see p. 2, here) and demanded $25.5 million for it – a figure well above the CRA’s $9.1 million appraisal. In 2012, when the city’s bid to wrest the remaining lots from Sasson evaporated with the dissolution of the CRA, so did hopes that the blight would ever be meaningfully remedied [more on that history is here]. For reasons unknown, the fencing does not surround the entire lot at 84th and Vermont. Instead, it just adds to the blight. In the background is the DPSS building; Sasson sold that lot off in the mid-2000s, shrinking the parcels the community had hoped would become a major retail and housing center. Sahra Sulaiman/Streetsblog L.A.
Now here we are, a year after the groundbreaking, with the lots only partially fenced off and as unkempt as ever, and the only reasonable conclusion seems to be that the project is going nowhere. Not because the proposed project was particularly beautiful or because malls are such a livability asset, of course. But because if youth want a safe place to hang out with their friends, somewhere to stroll in the evening with their families, a place they can get a job to help pay for school, or somewhere to catch an open air performance that is within walking, biking, or bus distance of their home, there are very few places in their neighborhood that they can go to. South Central deserves so much better. *Story has been updated as of June 2 to note that requests to speak with staff at Councilmember Harris-Dawson’s office went unfulfilled. Prior wording (“ignored”) seemed to indicate their office had no interest in tracking the project when I know Harris-Dawson was active in agitating for something to happen on the lots for many years. There appears to have been a miscommunication with the press aide. Apologies for any confusion. **Streetsblog generally doesn’t cover mall projects. I covered this story for two key reasons: 1) as noted in the piece, the blight has effectively served to hold the community hostage and thwart much-needed economic development for more than two decades now and 2) privately-owned spaces can sometimes function as de facto public space in communities where the public space is insecure. With regard to the latter, gang activity in the surrounding neighborhoods, particularly to the south of Manchester, has made the public space hard to access, especially for young people. An open-air retail center designed to encourage pedestrian activity (especially one with a quality grocer) can give area youth and their families a safe place to hang out, take an evening stroll, or take more control of their health. Youth often describe feeling trapped in their homes – particularly in the winter, when the sun sets much earlier – because there are no places they can hang out nearby and they can’t be out on the street after dark. So, a project like the one proposed actually can improve walkability in a community, even if it is not in the form urban planners might normally define it. The demand for all of that retail space may not be there. Cities love retail for the sales tax, but bricks and mortar retailers are becoming more and more rare what with online shopping. It also looks like there are a few nearby competitors for any potential grocery store. Maybe a three-story mixed-user with apartments above and a few retail spaces below could do well there, like the one at the southwest corner of Vermont and 83rd. Who knows though. At the end of the day, someone’s got to put some money on the line and follow through. True… the plan doesn’t exactly fit the existing neighborhood, and I think there are better ways forward. But South LA does lack destinations and entertainment zones. At the groundbreaking, there was talk of buying the buildings across the street for a movie theater and other amenities. Something like that would be very, very welcome. A shopping center that was food-centric would also provide the many professional people in the area a place to lunch, meet up, etc. And there is some buying power in the community and a need for retail…right now, youth I know in the area actually make the trip to Glendale to have that kind of experience. Other families head to Huntington Park to do their shopping. I personally am not convinced that the mall – as planned – is what the community needs and would prefer to see something more along the lines of Mercado la Paloma (a mix of smaller restaurants, culturally relevant and community-centric businesses, non-profit offices, performance spaces, conferencing/meeting capabilities… preferably with housing and other services mixed in). But the community members I met were so excited to see a big retail project there… and this is the story I get at least one email a month about – people really wanted to see the project finally go through. The part of this that is reinforced in the hood once again is a politician can say whatever they want in one moment, and act otherwise in the next. All of this with absolutely no fear of being held accountable, minus articles like this one, where they have no pressure to respond or comment at all. Parks throws a big party making himself look good, and nothing happens. This is the playbook on how to fleece the hood, it has been handed down in regards to South Central since the Watts Uprising. Sadly, it looks like it will keep being the go to plan of action. Use the community for personal gain while keeping resources, favors and political clout for oneself. Will nothing change until the makeup of the people who live here changes? We may not need Gucci and the Gap, but we could benefit from affordable healthy grocery options and a non predatory financial institution or two. Keep the stories coming Sis! Just tried to post the following on Harris-Dawson’s Facebook page, but I doubt it will appear since it has to be approved by his office…. community hopes only to (again) dash them. Marqueece Harris-Dawson has actually been tireless in fighting to see something happen on these lots for many years. His press aide was really the stumbling block, and she either didn’t know who to connect with me, even after I asked about specific people or didn’t see it as urgent. She has since moved on to another job. So, I think it was just terrible timing, not a disinterest in his office about speaking to me. I’m sorry if I conveyed otherwise. I think what bothers me most about this situation is that now we have someone like Harris-Dawson in office who genuinely does care, and he is still powerless against developers like Sasson. It shows how difficult change really can be. But many thanks for your concern! Then that’s just poor spokesperson work. Even if she didn’t know what to say or with whom to get you in touch, she should have corresponded with you. You may be right that she was the stumbling block, but I covered govt/politics in CA for years and I know that press aides are as difficult or easy as their bosses want them to be. Not in this case… MHD was the head of Community Coalition for many years and is deeply rooted in the community and deeply invested in raising it up. Their office was practically across the street from these lots, so he saw them every day. People in that area literally feel the blight those lots create in their bones. He’s asked that I connect with him directly next time, should there be any communication problems. His dedication to the district is more than genuine. I should have just pushed and gone around the press person when I realized she just wasn’t moving on those requests. Lesson learned. Ok. Hopefully you’ll get better responses next time. Thanks for the article! Too bad nothing has been built here. The project didn’t really seem appropriate for the neighborhood. There is a tone in the article and comments that the developer owes the community the project. That is not how it works. A project like this has many things going against it. For one, security costs would be astronomical both from crime avoidance in the common areas as well as shop lifting which is much more prevalent with Prop. 47. For a low margin business like a grocery store, that is a death sentence. Also, you’ll have much more trash and graffiti removal costs. I worked for a mall company and they were always shocked on how much more they spent on trash pickup in inner city malls in Los Angeles vs. the Midwest. They couldn’t believe how often people just throw trash over their shoulder and drop it on the ground over and over again here. Permitting, construction and so forth are much harder in the City of Los Angeles than just about anywhere, especially for an in-fill project like this. I hope something gets built here soon, but I wouldn’t hold my breath. Everything is moving to the Internet as brick and mortar just costs too much. I imagine this developer is having problems with so many of the things that can go wrong or has moved on to Texas and Arizona like so many others. I thought the Community Coalition of LA, (COCO), was opening up knewly remodeled offices over there, across the street from the Church of Scientology. There was a lot of money raised for this to happen…I wonder what’s going on? I was there for the groundbreaking and was under the impression the building would be up and running last August, at least that was what I was told as a volunteer for the project. CoCo has been at 81st and Vermont for many years. They went through a remodel and re-opened at the same site last year. It’s amazing–your donation has been put to incredible use. The remodeled offices feel very modern, are very bright, thanks to all the windows they now have looking out on the community, and buzz like a hive with youth planning all kinds of ways to make the world better. I love their site and I think the youth of South LA deserve more of those kinds of spaces. These lots are a few blocks away. I wish they were under CoCo’s stewardship and turned into a community asset, but unfortunately that is not the case. There seem to be an unfortunate set of assumptions about the community undergirding a lot of your comments, and I will just leave those alone. But I will say that, after 24 years, the developer does actually owe the community something. This isn’t a case where a well-thought out project has just been waiting for the right moment to be implemented. This is more the case of a wealthy developer living in Beverly Hills who has no stake in the community, no interest in even doing the minimum amount of maintenance to keep the lot in decent condition or at least compliant with city code, and no real investment in seeing the project happen or even a willingness to put the proper time in to come up with a decent project. The problem is the city no longer has a tool to reclaim lots like these for community-oriented projects (not that the CRA was perfect, of course) and the persistence of blight like this is what feeds negative stereotypes investors hold about the community. It would be great if he would partner with the city to do some sort of community-oriented thing or just get rid of the land altogether. But neither is likely to happen. The Plaza Mexico is a project in a similarly depressed area and it seems to do fine, but that had someone who had a stake in a good project. Unfortunately, in a free market society with private land ownership (and eminent domain authority stripped from redevelopment agencies), which I agree with Jerry Brown was totally abused) you can’t have the city tell anyone to build anything, unless they wish to contribute funds – which don’t exist. I agree with your comment. However, Plaza Mexico is a very different project from this. Also, it is in Lynwood not LA, which makes a difference. The developer has to pay property taxes on an empty lot too so it is not in their interest to have it just sit empty no matter how much the author insulates that. She seems to think because the developer lives in Beverly Hills he is just not building there to get back at the community somehow. There is an article in today’s LA Times partially on this that is a little more balanced. 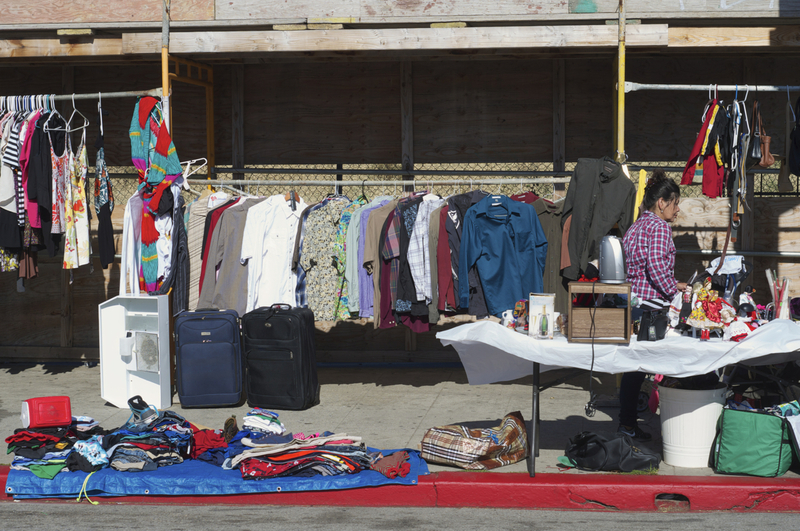 The South LA community is underserved in retail, which is unfortunate. There are a lot of challenges behind this that can’t be easily dismissed. One is security, which def costs more in South LA. Just a reality and cost of doing business. It is a major hindrance and projects like these often have a much narrow market area, because so many are afraid of coming into an area with different gangs. Look at University Village. USC will spend a ton on security here and when they wanted to build some nice retail, the Community basically shook them down for a bunch of money. So despite the South LA community all saying they want nice retail there is an element that does not and the USC example has likely given pause to any future developers. dude. i can’t with that nonsense. and USC’s penchant for security theater around that campus to pacify parents has been quite damaging to the surrounding community and fostered divides. and as far as the LAT story, they picked it up because of the questions i raised. i started making phone calls in April, letting Sasson know then that a story was coming. it appears to have set things in motion. i will take that as confirmation of the assertions made in the story. Congrats on furthering the issue. I still feel the LA Times article is much more balanced and objective across the board. No offense but your point of view is consistently one sided and thus less journalistic and more like a community activist. USC has to spend on security, because when you have instances like international students murdered just sitting in their car and it becomes an international news story, it harms the reputation and mission of the University. It threatens their ability to attract students, donations, and of course the safety of their students. You also can’t deny that USC had to pay $20 million in “community benefits” for University Village. That was a shake down straight up. In this case USC can’t easily move their campus (although they did consider to get out in the 70 and 80’s after Pepperdine moved out of South LA), so they had little choice. A developer is not in the same position. They can just sell their land and be done with it. The concerns are the same for a large retail project like this. One shooting or a few muggings in the parking garage and then no one comes. The risk is greater here and that costs money to try to mitigate. It is just one concern though. Even Wal-Mart failed in the Crenshaw area despite little competition in their category. Some of this may have to do with avoiding LA’s new min wage law. Lots of reasons why retail is tough here. The community youth may want a place to hang out and you can’t blame them for that. Not sure how that works for the developer though. They need businesses selling things not people just hanging out to make this a possibility. Maybe a Boy’s Club will be built here instead. The LAT article actually reaffirms a lot of what I said, if you read carefully. I first reached out to Sasson’s office at the end of March. Then again in very early April. Then again in mid-April. Then again in May. There was no engagement with the city on the project prior to my making those phone calls and his claims that DWP is the hold up are pretty roundly shot down by the DWP rep who says that is nonsense. Which is not dissimilar to what I heard from city planning folk I spoke to who had been involved in the project and actually asked me what was up with it because nothing had crossed their desks in so long. The Crenshaw Christian Center, also named in the story, had also not heard from Sasson in all this time. They had spoken with Duenas. But Sasson was AWOL. Sasson paints himself as a dottering compliant nice guy who got strongarmed into pleasing the councilman. What I was told was that Parks was key in getting permits pushed through so they could get to work and they were grateful to him for that. And yet the current councilman has struggled to get Sasson to do even minimal maintenance on the lot – their office has spent the last year lodging complaints because of all the problems there. So you can think what you want – but the reality is what it is. Do costs and return on investment matter – of course. No question. I would never suggest otherwise. Nor would I suggest that this was all Sasson’s fault. The failure of the city to follow through with promises to invest in the community following the unrest has allowed for the stasis. No question there, either. But Sasson never was invested in this project in the first place. To promise something to a community that has been so disenfranchised when you are not only not prepared to follow through but you really haven’t even begun the work necessary to properly follow through… that is something it is fair to ask a developer to answer for. That’s really all I have to say about that. Yes, her “reporting” is slanted and sometimes she writes things for click bait that are flat out lies. You kinda have to read through her interpretation of the events to see what’s actually happening. Everything you’ve said is spot on. Business owners don’t want kids just hanging around, and brick and mortar is dying. I don’t see that area having the buying power for the kind of stores that were intended to be there. 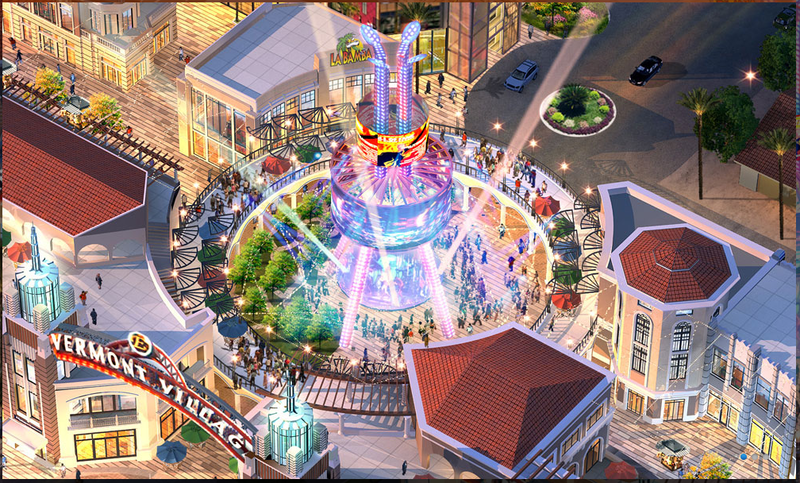 Everytime I hear about a new mixed use building going up with blah blah square footage of retail space, I cringe. With stores like Khols, The Gap, Sports Authority, Aeropostale, and even high end stores like Ralph Lauren closing or greatly reducing the number of locations, I fail to see how anyone could justify opening a reatail mall in this area. At least University Village has somewhat of a built in consumer base. Are we supposed to believe some single mom is chomping at the bit for a Chanel or Gucci store? Nope. That’s the last thing that are needs. The proposed project includes a six-story structure housing 180 affordable units, a public charter boarding school, a career technical education center, neighborhood-serving retail, community spaces, and a transit plaza. The fact that the community has spent nearly 26 years waiting for this project to materialize is just one of many reasons that the County's vote to condemn the lots came as no surprise today.